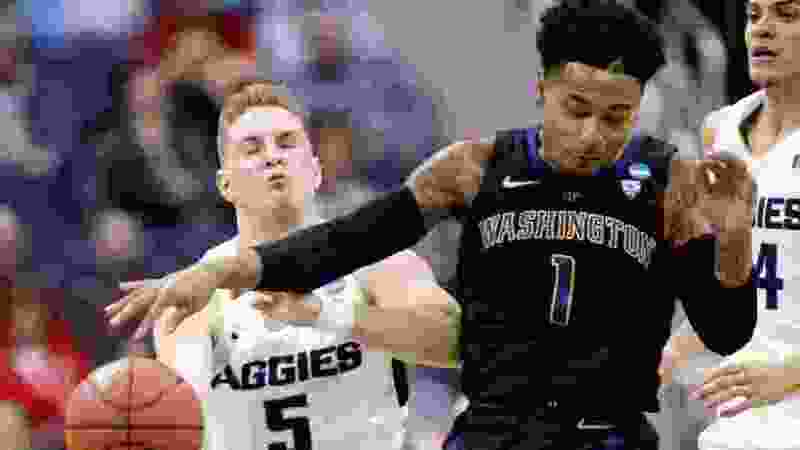 Columbus, Ohio • Utah State rattled off 10 consecutive victories to close out the regular season and the Mountain West Tournament, but fell short in the first round of the NCAA Tournament 78-61 to Washington. The Aggies wrap up the season with a 28-7 record but are still searching for their first NCAA tourney victory since defeating Ohio State 18 years ago. “I want to congratulate Washington. I thought they played fantastic. Really disrupted us. I thought we were really tentative in the first half,” said USU coach Craig Smith. The surprising Aggies produced an outstanding season this year, and while they certainly would have liked to have scooped up a victory in the NCAA Tournament, the press room inside Nationwide Arena was upbeat for Utah State. The Aggies return a boatload of talent next year. “I’ve coached for 23 years and I’ve never seen a team come together like this. How far this team has come — I just wish every coach can coach a team like this. It’s just an amazing group to be around,” said Smith. “This group is a band of brothers. They will always be connected. Leading up to the contest there was plenty of buzz about Washington’s defensive zone pressure. The Huskies’ smothering attack proved to be as good as advertised as they got their offensive motor going on the strength of 21 forced turnovers. The Washington roster features plenty of height and long arms. “It’s very difficult for us to replicate that in practice,” said Smith of the Huskie defense. Early on things looked good for the Aggies, who started with a spark and enjoyed a lead for the first six minutes of the game. However, it was Washington who pulled away and constructed a 12-point advantage at halftime. USU was forced to play catch-up the rest of the way. The Aggies are a gutsy bunch and refused to go down without a fight. Utah State produced a spirited second half rally and when Merill canned a 3-pointer with just under 10 minutes to go in the game the Aggies had cut the deficit to one at 54-53. “As a team, we’ve been in this position before where we’ve been down going into halftime. We all came together at halftime. We just decided it’s time to come out and really just not be tentative like we were in the first half,” said Brock Miller. However, Washington responded with enough plays down the stretch to pull away. • Washington’s Noah Dickerson scores a game-high 20 points. • Utah State places four players in double figures, led by Brock Miller with 13. • USU’s Sam Merrill goes scoreless in the first half and finishes with 10 points.